Computer is a necessary thing in our life. As a tool, we should maintain and protect it very much in order for it to work normally and even perfectly. There are two parts need us to protect, hardware and software. 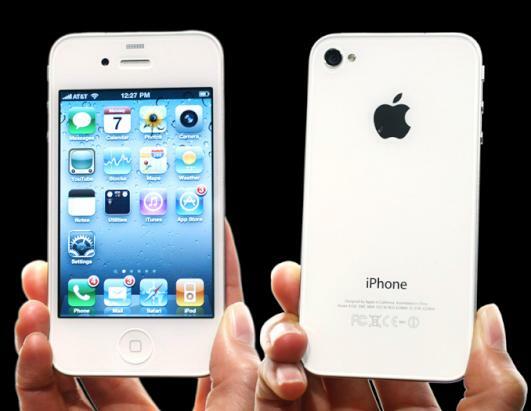 For hardware, we should use it correctly, don’t power off suddenly, upgrade to the newest hardware as soon as possible. For software, we should center on operating system. To protect system, we need anti-virus program, backup software and other optimize applications. In this article, we will focus on backup software – AOMEI Backupper. 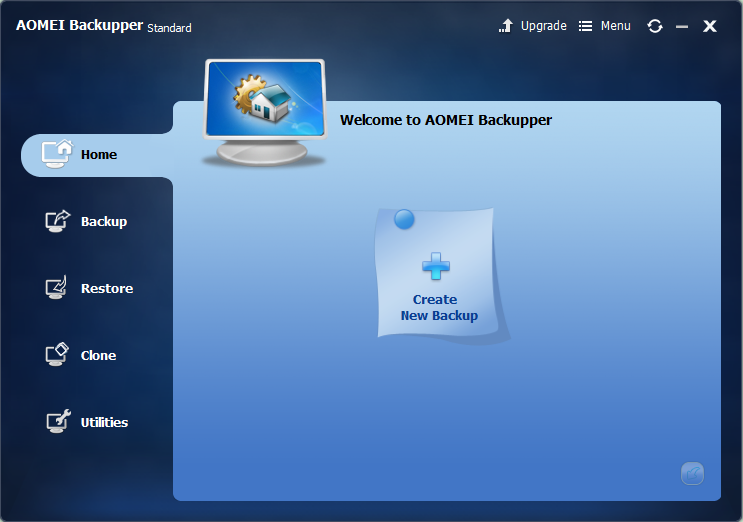 AOMEI Backupper, as its name suggests, it is easy to understand, it is a backup software developed by AOMEI Technology. If you want to know more about it, you can google AOMEI Backupper or visit its official website. Of course, another shortcut to know AOMEI Backupper is reading this article. To learn a new thing, a practical way is using it by yourself. So, let’s download backup software – AOMEI Backupper, install and run it. The main interface as following picture shows. The panel is empty because there is not backup task yet. If you have created backup tasks, they will be displayed on the screen. To create a backup task, you should go to Backup panel, there are five selections: system backup, disk backup, partition backup, file backup and file sync. Every selection has sub-options. 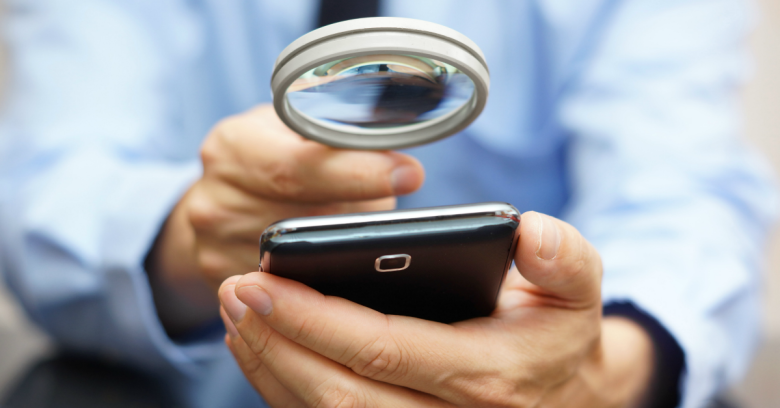 In a word, AOMEI Backupper is simple to handle, when you set OK, you can start backup. Restore panel lets you do restore task. You can also do restore from the Home panel. AOMEI Backupper supports universal restore, selective restore, restore from bootable disc, restore with partition alignment, UEFI/EFI restore and so on. 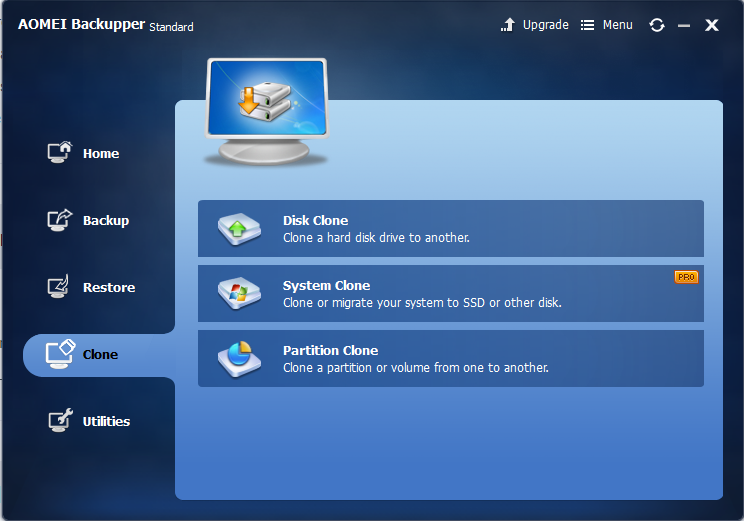 In clone panel, AOMEI Backupper supports disk clone, system clone and partition clone. It also realized command line clone and clone with partition alignment. 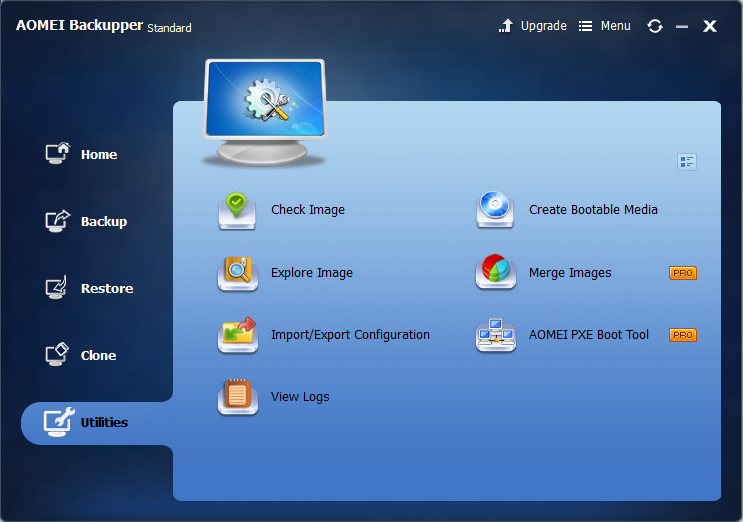 The last panel is Utilities, AOMEI Backupper integrates a series of utilities: check image, create bootable media, explore image, merge images, import/export configuration, AOMEI PXE Boot, view logs. There are several editions of AOMEI Backupper. The most used edition is AOMEI Backupper Standard, which is a free backup software for Windows PC. 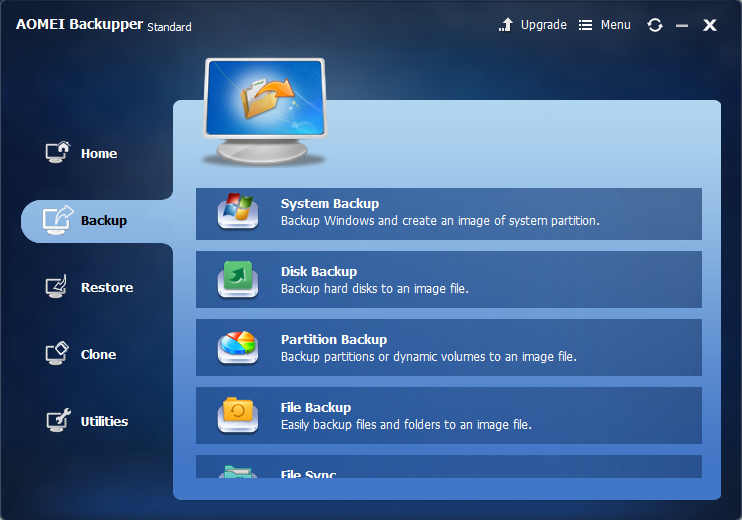 If you are looking for a Windows backup software, AOMEI Backupper is a good choice.